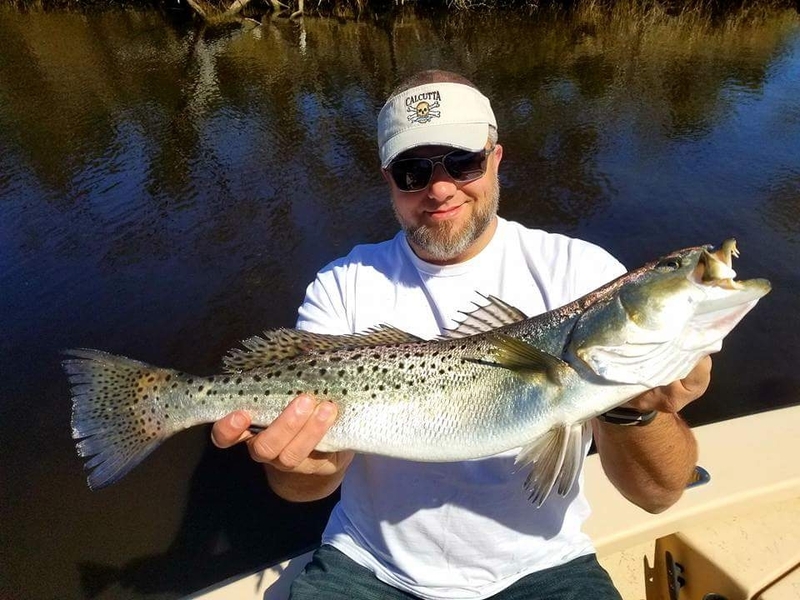 I have been fishing at Topsail Island and around Surf City in March of 2018 and have a fishing report here for anyone who would like to see it. Oh, and I caught this citation trout the last week of March! The water temperatures are in the 50’s at the Topsail Island Pier. A couple of mullets are in the surf. Also, there are no fish in the sound other than a couple of rays at the south end of the island. However, in the streams there are tons of red drum, black drum and trout. The drum can be small at times and are moving around from hole to hole where they can stay warm. The trout are biting when the water is clear. No trout can be kept this year due to the fish kill which occurred due to cold temperatures this last winter. As of the last week of March 2018 the water is only 54 degrees. Brr. Off shore Topsail Island they are catching fish such as Mahi.